This is a beautiful large sinamay disc headpiece in dark purple, with three magenta silk roses and loops of folded crinoline that sit over the head on the opposite side to the disc. 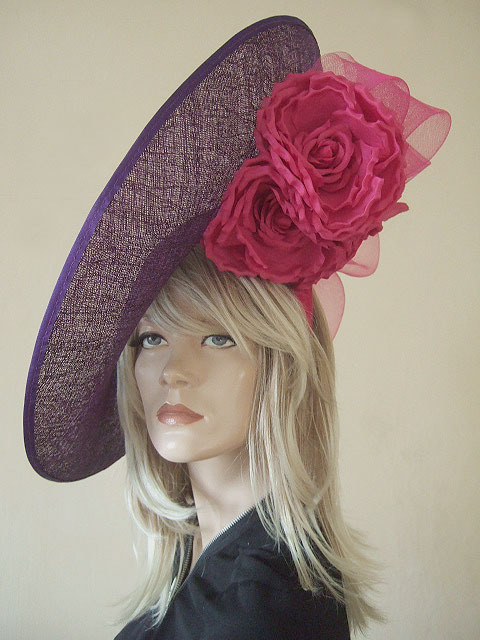 Fits all sizes with two magenta velvet alice bands..
Hat No Longer Available Please check www.dress-2-impress.com for current range. Height from top of ear to top of saucer when worn is 10".